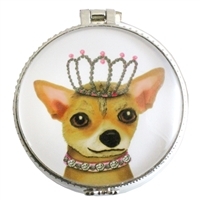 World Buyers has a great variety of dog related gift items for the wholesale market including paperweights, glass coasters and even coin purses! Little pup photo frame. Antiqued black dog on wooden block. Poly-resin and wood. Some light assembly required. Photo size apprx. 2.5"w x 1.5"h.
3pc min. Must order in increments of 3. Mason jar with little boston terrier topper. Poly-resin, metal, glass. Ceramic white bowl with antique bronze dachshund stand. Posing pup photo frame.Photo frame on wooden block stand. Photo size apprx. 2.5"w X 1.5"h. Poly-resin and wood. 4pc min. Must order in increments of 4. Sitting pup antiqued metal 6" ruler. 6pc minimum. Must order in increments of 6. White and gold ceramic ring tray with cute little dachshund resting on the edge. 6pc minimum. Must order in increments of . This little guy is allowed on the table! Imagine several "walking" down your tablescape. Clearance price shown now nearly 50% off! Adorable pencil pouch with vintage pup artwork. 8pc minimum. Must order in increments of 8. Four adorable illustrations of man's best friend on blue leafy filigree background. Metal clasp closure. Assorted clasp coin purses with six regal canine designs! Assorted fancy canine portrait coin purses. Metal clasp closure. Keychain coin purses with cute pups wearing glasses. Colorful chevron pattern backgrounds. Assorted dozen. 60 assorted mini square matchboxes featuring vintage holiday animal art. Colored match tips. Matches ship ground only to continental USA ONLY. No Canada or overseas shipments. All dressed up for the occasion! Delightful bone and dog tray in shiny gold. Great gift for him or her and dog lovers! Clearance price shown now 50% off! Small antique style tray featuring an adorable pampered pug with a pearl necklace. 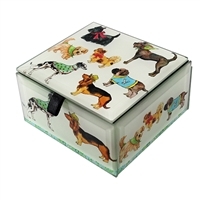 Glass box with vintage artwork of dogs of all sizes and colors. Perfect for dog lovers! Keep your small special items in this small ceramic trinket box featuring a little jewel adorned Teanie! Lid is glass and base is ceramic. Each dog with it's own fancy costume. Set of 6 magnets in each gift box. Minimum is 3 gift sets. Six unique designs! Dogs, Rabbits, a Zebra & a Meerkat all on their own vintage bicycle. Set of 6 magnets in each gift box. Minimum is 3 gift sets. Cute little antiqued gray metal ring holder.